A day out at Aberdeen Beach is a real treat for all the family. Part of the fun at the boulevard is a visit to the Codonas amusement park and rides and the Miami Beach and Sunset Boulevard Complexes. There is something for everyone to enjoy. Some of the amusements are in buildings within the Sunset Boulevard complex, so no need to worry about the weather. Though we do get some glorious sunny days here, so you can enjoy the outside rides and attractions. 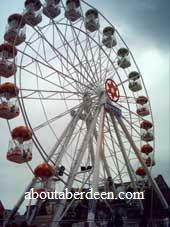 The Grampian Eye Big Wheel, nicknamed the Aberdeen Eye, is the top attraction of Codonas Aberdeen. It has 20 Gondolas, each of which has room for 4 people. The wheel is 100 feet high and gives you some stunning views out to the North Sea and around the city and bay. There are also three different sized roller coasters ranging from a very small and gentle roller coaster which is suitable for smaller children through to a stomach churning looping star one. For those who love to get wet there is a white water log flume ride. The haunted house at Codonas amusement park will get your heart racing as the ghosts and ghoullies jump out! If that doesn't get you going then try the waltzers that spin you round and round at a terrifying speed. Younger children who can't go on the waltzer can enjoy a range of gentle and fun rides that are scattered around the park. Scattered around the complex are ice cream and candy floss stalls, knock the coconut stalls, face painters and sweet stalls. Inside the Sunset Boulevard, which is open daily from 1000 hours, they have the latest simulator machines, video arcade machine and slot machines. Up in the Cuba Bar there are 10 full sized American pool tables. There are also the dodgems and a 26 lane ten-pin bowling area. Smugglers Coveis a fun and safe adventure area for younger children where they burn off their energy by swinging and jumping about in the padded obstacle area. A tiny tot's band can be purchased which gives the wee ones 2 hours of play and on the smaller rides such as the safari train, the giant slide, mini racing bikes, the bouncy chute and the apple coaster. This area was formerly known as Ramboland. VIP passes can be purchased which gives unlimited access to all the rides and the dodgems and a main meal at the buffet at Miami Beach. Dodgem the Dog is the mascot of the Aberdeen amusement park. He joins children in the rides and walks through the park having fun with the kids. Dodgem the Dog was the winning creation of Mintlaw Primary School pupil Amy Cardno whose competition entry saw Dodgem being creating. Her design and great name for Dodgem the Dog also won her classmates a VIP day out at Codonas. The Miami Beach and the Sunset Boulevard Complexes have a range of restaurants, bars and cafes to suit all tastes and ages. These include a Burger King, a Mexican Restaurant, TGI Friday and a Pizza Hut. There is a crazy golf park - read our review and see photos. The Galleon Family Pirate Ship ride swings high into the air and goes back and forth as you the pirates cling on for dear life! A review and photos to follow soon. Parking is free at the Beach Boulevard area and is easily sign posted from the city centre. More days out for the kids.